Free Table Cloth @ Target!! Target carries disposable tablecloths for $2.59 and has many clearance cloth tablecloths including Halloween themed tablecloths on sale for $3.00! 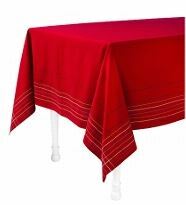 Get a FREE tablecloth or deep discount with this printable coupon HERE for $3.00 off any tablecloth!